This high-protein and high-fiber Gluten-Free Banana Oat Bread makes for one hearty and filling loaf perfect for breakfast or any time of day! 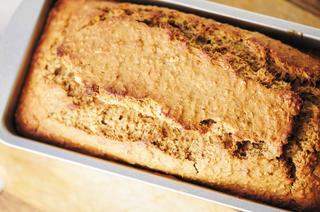 This healthy & hearty banana bread is chock full protein, fiber & many essential nutrients! butter, but this loaf is certainly great any time of day. With a killer combination of oats, yogurt & almond butter...I promise it will be one of the best banana breads you've ever tasted! Subtly sweet, chewy, and delightfully filling..
Preheat oven to 350°F.In a large mixing bowl, combine dry ingredients.In another mixing bowl, combine wet ingredients.Mix your wet & dry ingredients together until just combined.Pour batter into a greased or parchment-lined loaf pan.Bake 1 hour - 1 hour, 15 minutes, or until turning golden & a toothpick inserted in the center comes out clean.Let cool completely before slicing.Enjoy!